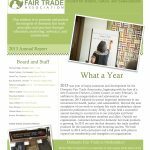 The DFTA’s Annual Reports are a reflection of the year-long efforts of our members to protect and promote domestic fair trade. From profiles on member organizations to updates on the state of the market, these reports look at the details and progress of the DFTA’s work. 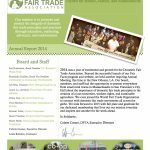 The reports also contain the names and member affiliations of Board and Staff by each year, recaps of the Annual Meetings, a disclosure of financial information, and updates of the Fair Facts Program. Stay up to date with the the movement by reading the DFTA’s Annual Reports!